A 6-year-old Buffalo boy ended up in the hospital after being hit in the head repeatedly with a belt buckle on his bus ride home from school, his mother tells 7 Eyewitness News. The incident happened Friday afternoon when Aiden Taylor was coming home from West Hertel Academy. 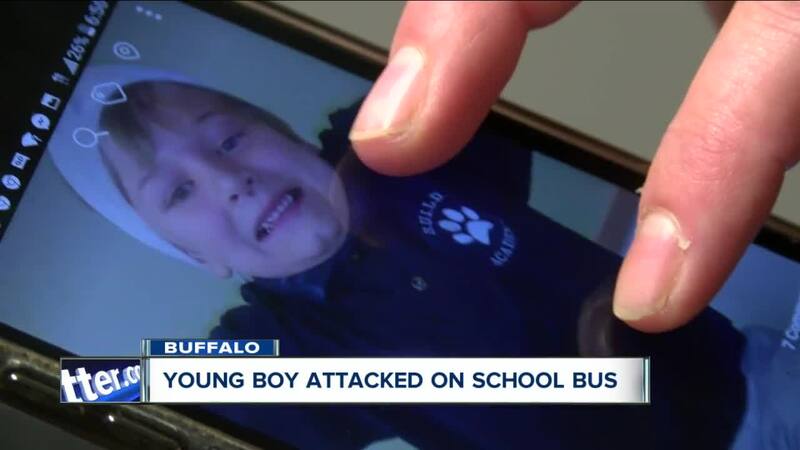 BUFFALO, N.Y. — A 6-year-old boy ended up in the hospital after being hit in the head repeatedly with a belt buckle on his bus ride home from school Felicia Taylor, the boy's mother, said. The incident happened Friday afternoon when Aiden Taylor was coming home from West Hertel Academy in Buffalo, New York. A spokesperson for Buffalo Public Schools says the district is aware of the incident and is investigating. All proper protocols were followed by the district and the bus company, according to the district. "School administration will further investigate and issue discipline, as appropriate, in accordance with the district code of conduct. The district expectation is that protocol is always observed and student behavior on school buses is appropriate. Inappropriate behavior is always subject to discipline per the code of conduct." The buses in BPS are owned and operated by First Student, a Cincinnati-based company. A spokesperson said the driver followed all proper protocols. Video cameras on the bus, owned by First Student, recorded the incident. No one at the company would discuss what the video showed, but say the recordings are being shared with BPS. Aiden's mother said her heart sunk when she saw him in the hospital. "I shouldn't feel helpless," Taylor said. "My son should be safe in the school." A 12-year-old student "took off his belt and hit [Aiden]," according to Taylor. Her son suffered two lacerations which required two staples in his head. An ambulance had to take the second grader to Oishei Children's hospital after the incident on the bus. The driver followed all protocols, according to both the district and First Student, which included pulling over safely after becoming aware of the incident, evaluating the student's injuries and contacting the bus terminal dispatch. Someone immediately called 911. According to First Student, there was no bus aide working at the time. Bus aides are employees of BPS, according to the bus company. "I can't be there to protect him and it's really frightening, sad and scary," Taylor said. "It's not fair. They should be protecting our children." Taylor said she plans to file a police report. Officers responding to the scene were told by First Student the district had been notified and would handle the situation internally.